Still working hard, here's some fish..(not sure I've finished but first of a series)..drawn from a photo (when I should have been cleaning on my only day off this week) because it's way too hot to do it from life......funny smelly fish stories to follow soon. Thanks for your kind comments everyone! I don't always leave comments, but I always love seeing your drawings. You are so talented! It's lovely, but I can imagine the real thing would smell a bit in the heat. Looking forward to seeing some more! I like your fish very much! It's a fun and well-executed painting! You are so creative! I also love the blueberry cheesecake down there... you made it look so luscious! This is lovely. 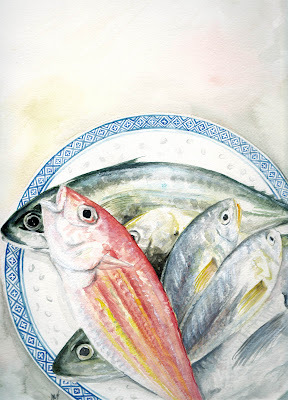 I like the balance of a touch of pink in the background as well as composition of the fish. Wonderful sketch. You rendered this image so well and accurately! The blue plate really makes the top fish POP off the page. Incredibly realistic. Youur painting style is superb. Love the shine from their scales. Beautiful colors and composition. Thanks for sharing it.